I am very much a beginner when it comes to quilting. I am still a little intimidated by the process, but I feel like I am slowly getting there. I decided that I wanted to make a quilt for a baby gift. 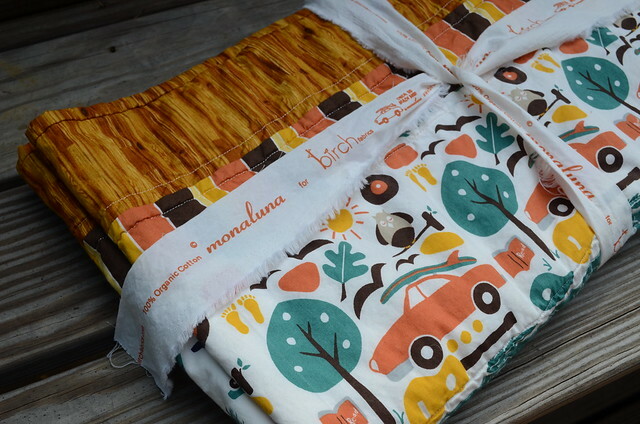 I knew I wanted to use organic material, so I found this adorable fabric at fabricworm.com. I fell in love with it instantly. I did some sketching, some math, and finally settled on a plan. I decided to do a simple striped quilt utilizing the whole width of the fabric. I used 7 different fabrics. I already had the Michael Miller woodgrain fabric, which matched perfectly. 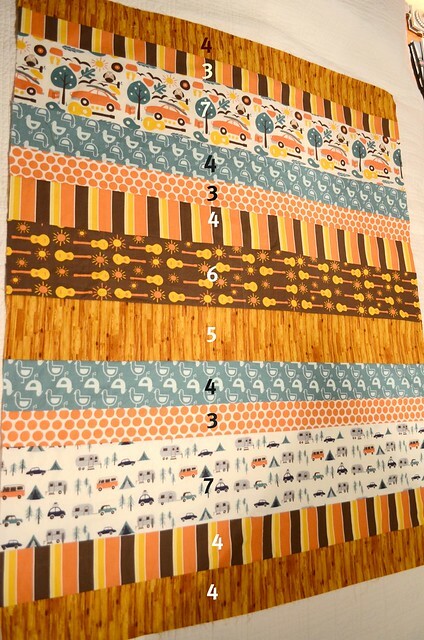 I ordered a half yard of all the fabric except the orange dot fabric that I used for the backing. I used 1.5 yards of it. I would suggest getting 2 yards of the fabric you are going to use for the backing though. I had absolutely no wiggle room with the 1.5 yards. I also had a yard of the woodgrain fabric so I used it for the binding. Finished Quilt Size: 40" x 50"
I wanted the stripes to be random widths. I labeled the photo so that you can see the measurement of each stripe. I used the width of the fabric selvedge to selvedge. Then once the fabric was cut I trimmed the selvedge off and made sure they were all the same size. The ended up being about 40" wide. I pieced the quilt top together. Then I realized that I did not quite have enough for the backing so I added a stripe towards the bottom. If you use 2 yards of fabric, you should be able to have the whole back solid though. 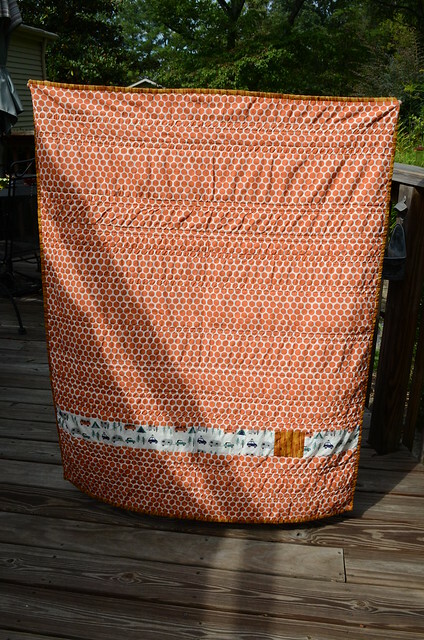 Then I basted the top, batting, and backing together and quilted it. I lined up my walking foot on each of the seams and quilted along each side. I used a 2.5" strip for the binding. I sewed the binding to the back by hand. I really like how it turned out. So cute! 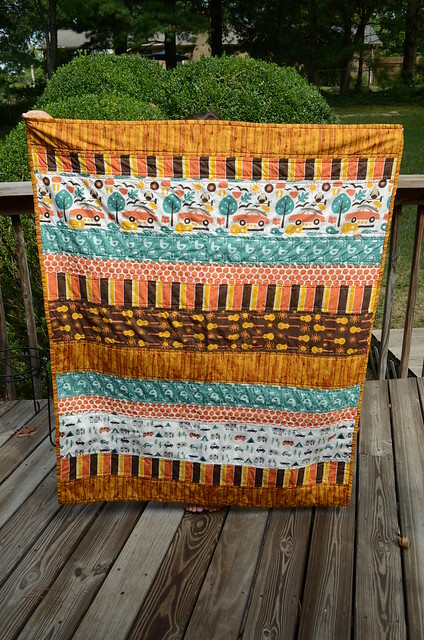 I have recently becme obsessed with the idea of making a quilt (thanks a lot, pinterest!) and am always on the lookout for an easy o e to try. This is adorable! Oh, Jen. The fabrics are gorgeous and I love the stripe on the back! 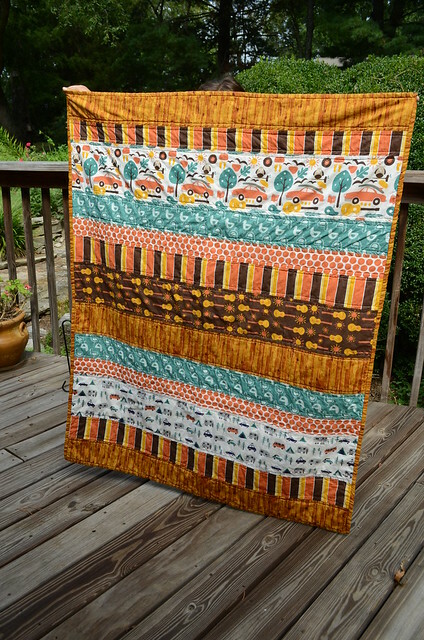 It is a great, great quilt!! So cute! Thanks for sharing this. 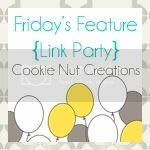 :) If you get a chance, I'd love to have you link up to my party at http://scrapbookingez.blogspot.com/2011/09/one-stop-thursday-linky-party.html. Thanks again! It's beautiful. 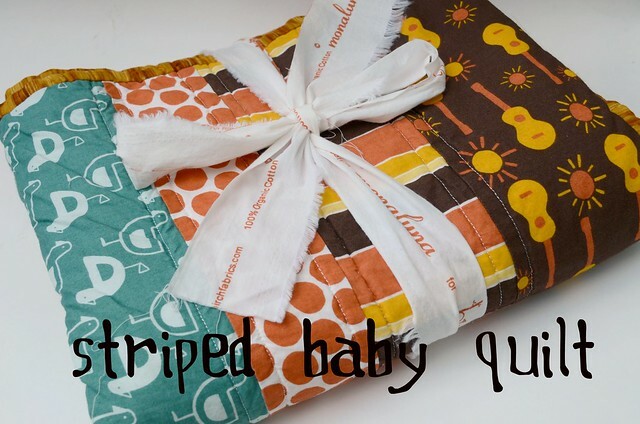 I love strip quilts. That is very cute! I bet whoever gets it is going to be a very happy camper. :) Oh, and you even did some hand sewing...good for you! Last week I did some hand sewing of hems (ick - tailoring! ), and it takes so long but looks much better. Gorgeous! I love the mix of fabrics. I am clueless when it comes to putting fabrics together (unless they are all the same colour!) But yours look so cute together, and really well finished. This is gorgeous! Great job!